Provide the edit field with a title here. Click here for more information about defining titles. With this setting an edit field will be made a mandatory field. This means that a page may only be saved in the browser if all required fields have been filled in. The user will be notified with an error message about all required fields that have not been filled in. 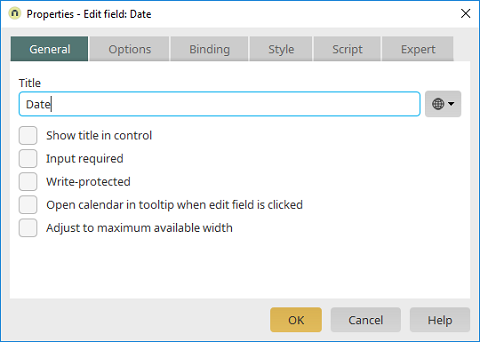 This setting means a small calendar will immediately be shown when a user clicks on the edit field in the browser.